Topps Stadium Club photographer: "Hey, Orel. Nice to meet you." 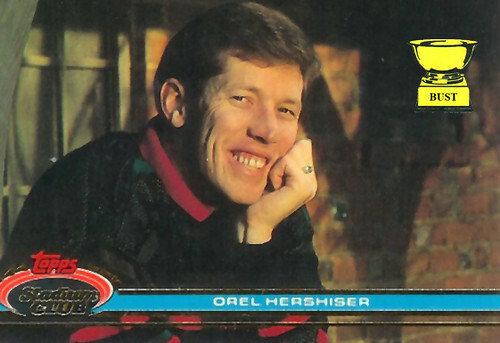 Orel Hershiser: "Hi! I'm so excited for this shoot." TSCP: "Apparently. You brought props?" OH: "Sure did. Can we start?" TSCP: "Uh, sure. OK, get comfortable." TSCP: "I think you can lose the mortarboard." OH: "Really? OK, how about this?" TSCP: "Um, you should take off the cheap robe." OH: "Bummer. OK, how do I look now?" TSCP: "No need for a fake diploma, Orel." OH: "But how will my relatives know I'm graduating high school?" TSCP: "Orel, buddy. This is a baseball card shoot, not a chance to take high school graduation photos." OH: "Stop killing my dreams. How does this hand-on-chin pose look?" TSCP: "That's fine, Orel. That's just fine. Big smile. One, two, three, cheese."